You know everybody is good at something, but how many people do you know that are actually good at waiting? It feels lately, like I am always waiting for something and what does one do actually while waiting? I am not talking about your typical waiting…the red light, the line at the grocery store, the Doctor’s office, the deadline, etc. I am talking about the waiting that is the kind that God ordains and you know he is trying to speak to you in that waiting. Unfortunately, I usually am so busy muffling His still small voice in the busy-ness of waiting that it seems tediously, exceedingly, abundantly long. Not that anyone would actually choose limbo, but there it is and here I am. It just kind of stumbles upon you when you least expect it! Have you ever found yourself there? That unsure place of many questions with no clear answers? Some have said it gets darkest just before the dawn and surely waiting is better than hastily making a wrong choice or conclusion. But let’s be honest, this kind of waiting is the kind that chomps at the bit and begs to be taken hold of somehow. Maybe it was a self inflicted situation. Maybe it was thrust upon you through injury, someone else’s decision, or even through watching a loved one suffer. Waiting like this is usually not easy. Wondering how God is going to work those things together for good…you know the verse. Pondering how when the path seems dim, unmarked and not unlike a modern day wilderness. I have never been good at waiting. Part of it is my genetic make-up and part is my personality. I have learned ( am still learning) to be a good “waiter”. My current circumstance holds much in the balance as I contend with waiting for news from a Doctor about a situation. I can remember as a child sleeping at my Grandmother’s house. 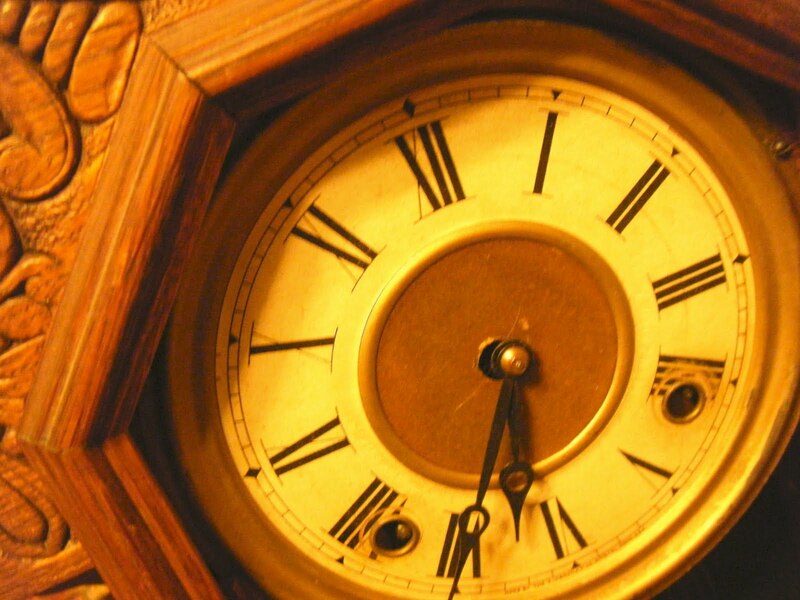 She had a wooden mantle clock it ticked loudly and chimed every hour. I would wait throughout the night for the chime to ring the number of the hour until eventually I fell asleep awaiting morning’s light. You know I never really have liked to give myself over to sleep because sleep is what you do while waiting for the next day! Regardless of the cause of the wait…I find myself looking at my Lord and then like Peter, looking at the waves. Glancing to my Savior, seeing His outstretched hand then looking back at the circumstances and finding myself sinking to the depths of the unknown. How I long to be free from double-mindedness. minutes and seconds into action. This same One holds eternity in His hand, my days He numbers and my hairs He has counted and I wonder, when will I Trust Him completely without holding back? God, I say, I want answers and now…for injustices, false accusations, and misplaced loyalties. But he bids me to wait…to trust and to seek Him with all of my heart. And what do you suppose I hear in my head? His still small voice? “The Waiting is The Hardest Part”! Previous The Comforter Next You Mean I’m Supposed to Rejoice?